Kouki Matsamura, an MS student from Osaka University, visited from August 12 to October 10 2018 to advance his knowledge of machine learning, do research in AI and music composition, and to participate in programs at Warren College and elsewhere. Kouki worked in the Warren College suite (B 106) and we met regularly. We are working on a paper tentatively titled “Machine Learning of Musical Styles for Music Composition and Improvisation.” A Blair student, also a Warren resident, advised us on this project, and we are inviting him to join the research effort. Kouki participated in many Warren events, such as Fresh Baked Fridays where students showed interest in his visit. I introduced Kouki to the Japan Program faculty and the McTyeire Hall Japanese graduate program coordinator, and Kouki established strong relationships with their groups, attending McTyeire dinners regularly and helping students of Japanese, in and out of class. Kouki benefited from these communities too. He left a card for Patricia and I, saying that visiting — presumably Vanderbilt, Nashville, and America — were the best two months of his life. He built lasting relationships here thanks to many Vanderbilt folks. “Travel around the World with Warren” began with Japan night, featuring three members of the Japan Program faculty (Michiru Ichihara Loe, Keiko Rose Nakajima, Asami Nakano), Kouki Matsamura, two graduate assistants, one parent, and 20+ undergraduate students from Warren College, McTyeire Hall, and across campus (Warren Faculty apartment, Saturday, September 29 from 5:00 pm – 6:30 pm). 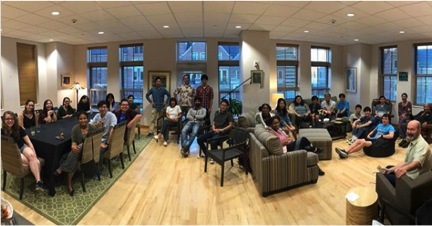 Kouki talks to students of Japanese on the culture and language in the Warren College office suite on a Thursday night. 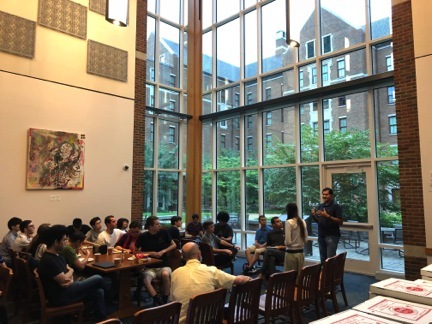 Computer Science and AI Professors Gautam Biswas and Catie Chang join 40+ undergraduate students from Warren College, and across campus, as well as Kouki and one Warren alum, for a discussion on the ethics of artificial intelligence (Warren Great Room, Saturday, September 22 from 5:00 pm – 6:30 pm). Kouki was able to do considerable networking at such events, and students got to know Kouki as well. One Vanderbilt student is now researching, with my advice on NSF possibilities, whether programs like the one that Osaka University funded for Kouki, are available in the United States. Kouki stayed in the guest room for Moore and Warren colleges, B168. This is a 10’x10’ living space, with a private bathroom. The room is next door to the Elliston Hall Head Resident. This guest room is now under the control of Associate Provost and Dean of Residential Faculty, Vanessa Beasley, though at the time the arrangements were made in late June and July, Faculty Heads had authority to host guests following OHARE guidelines. We hosted a dinner party that introduced Kouki to all Warren staff, including all RAs, before classes started. While the guest room for Moore and Warren colleges may not be suitable for renowned visitors to campus, it seems very suitable for graduate students who those renowned researchers could bring with them on visits to Vanderbilt. Like Kouki, these graduate students may have wonderful interactions with our students in the residence halls and elsewhere on campus, perhaps even hosting their mentors. Queen Oluwafemi Stevenson graduated from Vanderbilt University in May 2017 in Communication Studies. She was also a News & Communications Intern in the Office of Associate Provost for Strategic Initiatives and Partnerships. Graduating seniors were supposed to vacate Warren and Moore by 1 PM. All residents lost card access to the buildings by 5 PM, a reality that left me feeling not only inconvenienced (though it was absolutely my fault for failing to move out on time), but also deeply saddened. WAM residents will tell you that after 8 PM, serious frustration sets in when the only way we can get into our buildings is through the drawn-out process of checking identification with front-desk security, then making the extended trek to our rooms, as opposed to conveniently swiping through the doors close to the courtyards. 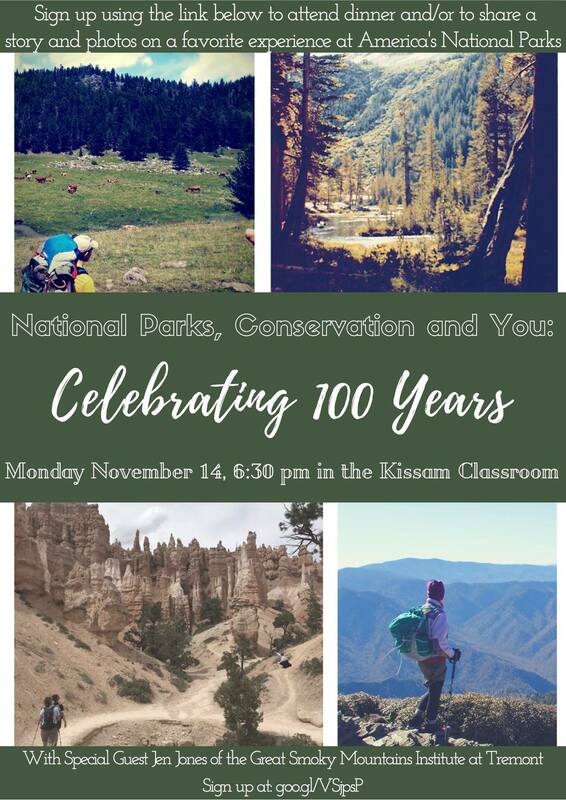 But for some reason, losing card access to Kissam in general rocked me to my core. For the past year, it had served as my home — the place where I came to rest my head, and walk to breakfast in the rattiest of t-shirts and slouchiest of sweatpants and feel perfectly fine about doing so. 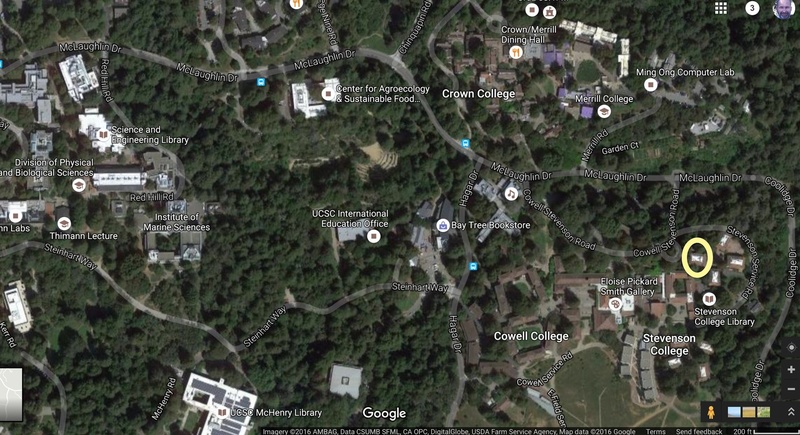 For the two years preceding this one, it had served as my unofficial home — I was there so often to study and eat meals that residents and staff actually assumed that I had lived there. In Spring 2016, after my ResEd ballot for a single proved unsuccessful, I decided to write an impassioned letter to Kissam’s area coordinator. In it I included my unparalleled appreciation for the WAM community: how helpful, warm, and welcoming the staff was (and is), how thought-provoking and topical the programming was (and is), and of course how delectable the food was (and is). I didn’t hear anything until the beginning of the Fall 2016 academic semester, when the most iconic email I’d received in my lifetime landed itself in my inbox and proclaimed that the ResEd staff had a single room for me in Kissam if I wanted it. I had never responded to a Vanderbilt email so quickly in my life. In the eight months that would follow, I grew into a stronger, happier, more reflective, and more present person. 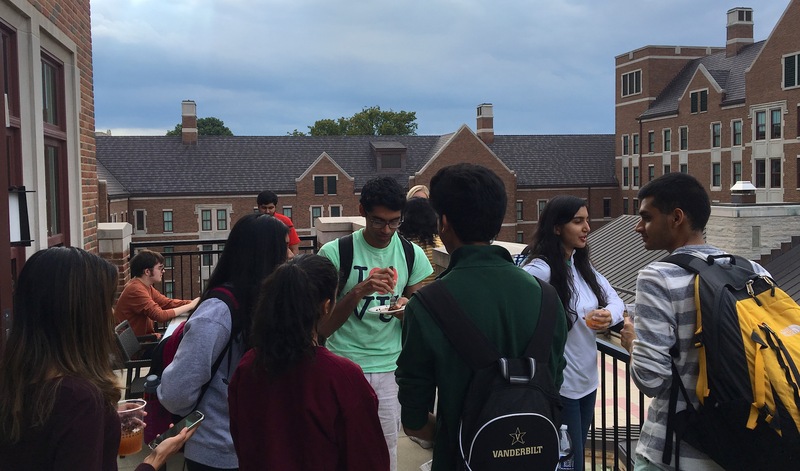 My senior year at Vanderbilt was the best year of my life so far, and living in Kissam laid the groundwork for such a fulfilling, fruitful end to my Vanderbilt undergraduate experience. I formed new, engaging, and enriching friendships, friendships that pushed me to think outside the box and to enjoy life’s most mundane moments, such as studying in the same common room spot for weeks at a time. In Kissam, I learned how to slow down and stay still, two actions that Vanderbilt students particularly struggle with. WAM’s open, airy Great Rooms provide unparalleled space with which to sit, ignore your emails, and think — think bravely, think deeply, and to think with peace. I can’t count how many times I did just that — I loved sitting in the Great Rooms and letting life’s big questions float around me, instead of consume me. I believe the most significant transformation I had due to living in Kissam was learning how to take chances. While I have always been outspoken and extroverted in personality, I’ve also been particularly safe, sheltered, and pretty reserved in character. That changed this year. 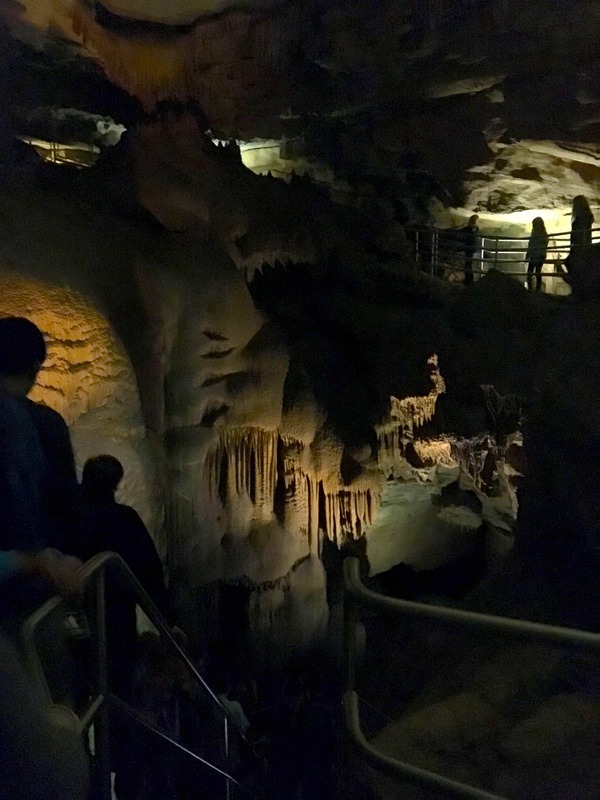 For example, during this spring semester, Warren and Moore offered a trip to the Mammoth Caves about an hour and a half north in Kentucky. Such an opportunity wouldn’t have even interested me a year ago, but this time, I decided to sign up. I won’t lie — I was scared. Upon entering the caverns, I was greeted with an immediate, unforgiving 200-foot drop. Each step down was more frightening than the last, and there were moments when I completely stopped, heaving and hyperventilating. But I had to keep going, because there were people behind me. Below were what seemed like endless depths and even though I was protected by guardrails, I could barely look over. Stalactites and stalagmites surrounded me; unknown moisture plopped onto my head the entire way down. Halfway through the descent, I started making parallels between this cave trip and my senior year. Each featured a degree of uncertainty; each drew out my fear and tested my faith; in each, many people had gone before me, and many people would go after me; and in each, I knew I had to keep going. I’m not usually one for nature, but joining this cave visit was one of the best, if unexpected, decisions I’d made my senior year, and of course I have Kissam to thank. Now, as I write this at home, memories over the past year flood my conscious — some joy-filled, some surprising, and of course, some challenging and disappointing. For all its perfection, Kissam wasn’t able to wipe away the hard moments, and this year I had many. Even though my senior year was my best year at Vanderbilt, it was also simultaneously one of my most difficult. But I am proud of the person I became while I lived there. I am proud of the way I learned to view challenges as opportunities, and how to ask for help when I needed it. And I am confident that these perspectives will serve me well in the post-college world. To many, the Warren and Moore Colleges at Kissam may just be a cool-looking collection of buildings. Or just a place to get the best food on campus. Or even just a dorm. To me, Kissam was one of the best blessings to happen to me during my time at Vanderbilt. I can’t ever fully express the level of gratitude I have for the community I gained while there — the absolutely amazing Kitchen staff, who not only blessed me with food, but also more importantly blessed me with their outlooks on life, their experiences, their laughs, and ultimately their wisdom; the security officers, who were there at all hours of the night and would sometimes grace me with cool conversations about anything and everything; the RA staff, who truly became my friends in earnest; and of course, my fellow residents, who taught me more than I ever thought I would get to learn in a dorm — excuse me, living and learning community. (I guess that’s why we call it that.) I am endlessly and breathlessly grateful for my time in Kissam, and I wouldn’t trade it for anything in the world. With all that said, you can see why I was so reluctant to move out in the first place. 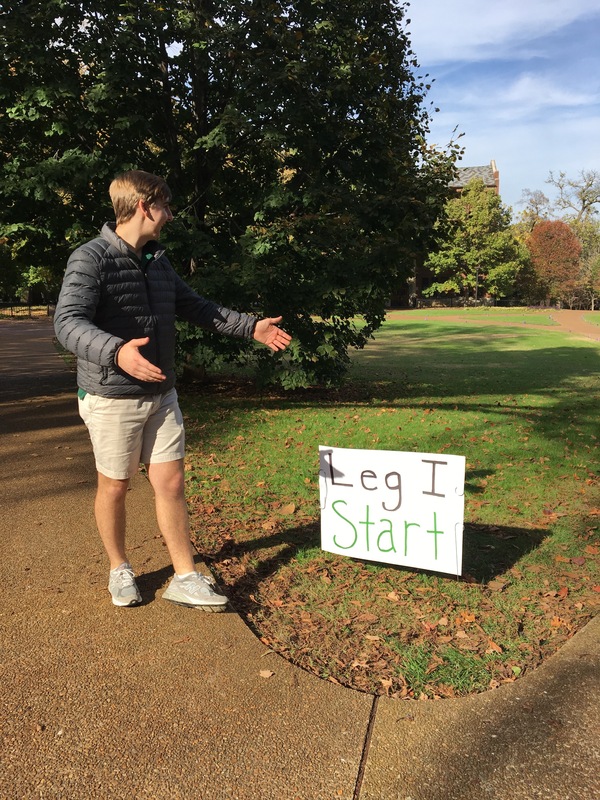 Standard disclaimer: This post reflects the opinions of the author and does not necessarily represent the opinion of Vanderbilt University. On December 1 and 2 there were back-to-back events in our nascent tradition of Warren and WaM student showcases. 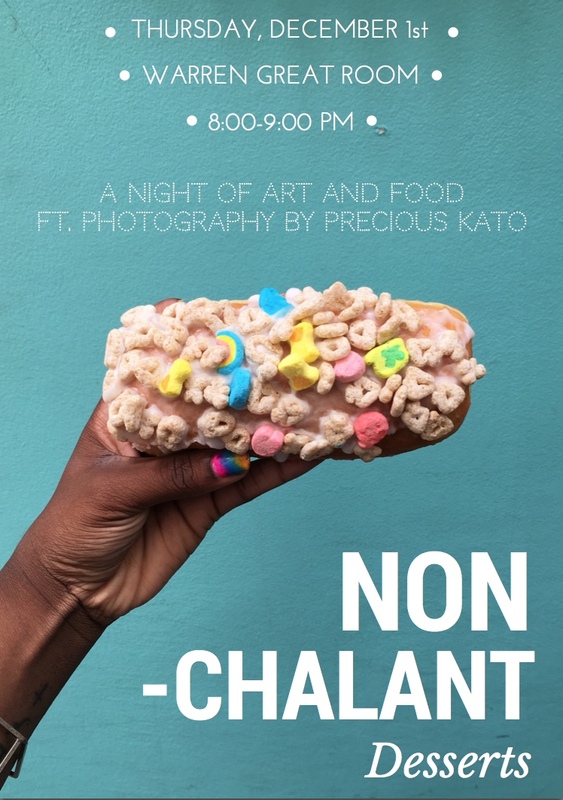 To open the month, Warren hosted Nonchalant Desserts, an evening exhibition of photographs by Warren student Precious Kato in the Warren Great Room. Campus Dining provided light reception foods and drink, and Vanderbilt Printing Services did a marvelous job of printing and mounting selected photos. The voluminous sound created by discussions around the Great Room indicated the crowd’s enthusiasm. This event, in particular, was the second Warren student exhibition of expertise, experience, and expression (e³) this semester. Thanks to Laurel Hogan for helping to organize this exhibition. Precious’ photographs will be hung around Warren College. 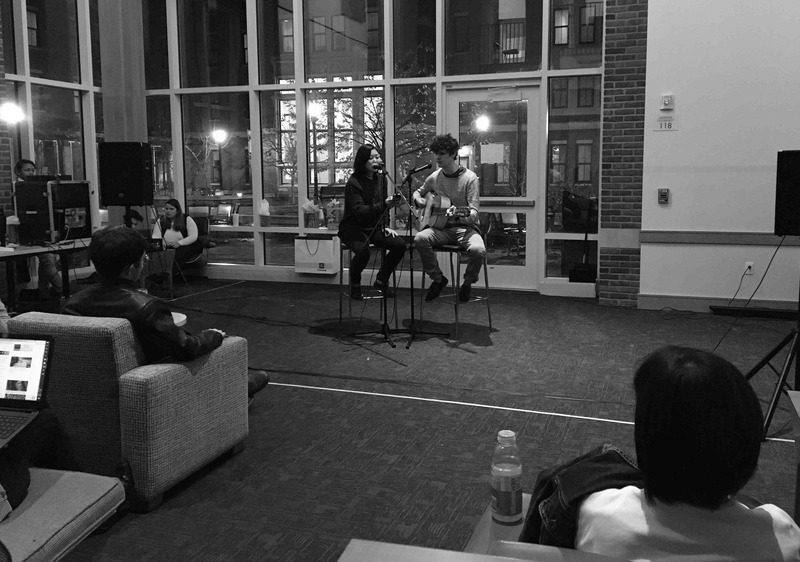 The very next night, Friday, December 2, the WaM RAs hosted Espresso Yourself, an open mic night of talent by WaM students. The performances went on for three hours, with breaks and raffle drawings throughout. We haven’t had an open mic night since year 1, and I hope that the fun of this event, which highlighted stellar talent from around WaM, continues in the future. Thanks to the RAs for organizing such a great event! Patricia and I really enjoyed it. Doug Fisher is Faculty Director of Warren College. The opinion’s expressed herein are Doug’s and not necessarily those of Vanderbilt University. 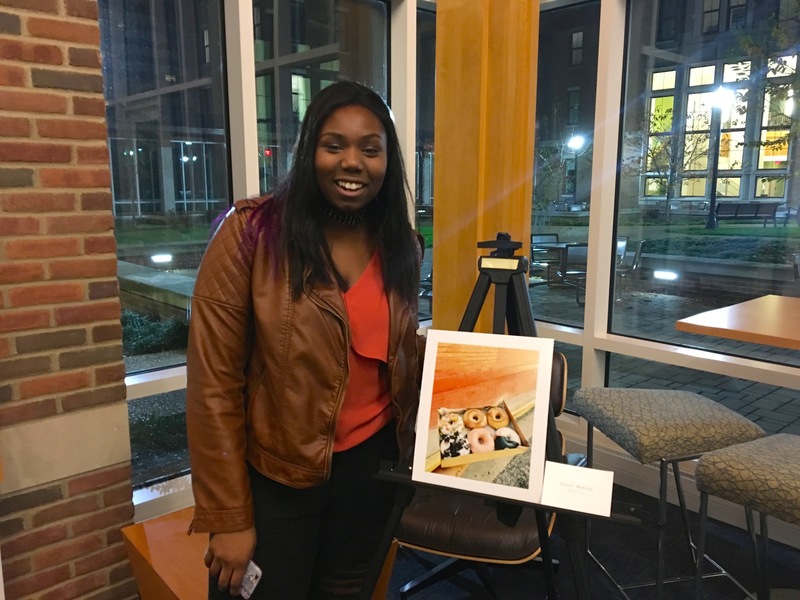 On October 29th, Warren College Council (WCC) and Moore College Council (MCC) jointly hosted Haunted Halls, a Halloween-themed event in and around the Kissam Center. An annual happening, Haunted Halls is a program designed to offer students an opportunity to interact with other community members through activities associated with the fall season. This year’s version of Haunted Halls featured a pumpkin carving station, a fire pit with s’mores, a photo booth, a live-stream of Halloween-themed shows, and an assortment of food and drink options, such as caramel and candied apples, hot spiced cider, and a mashed potato bar. Students greatly enjoyed the food, particularly the mashed potato bar. Many began lining up in the Kissam Center before the event began. Other students took pleasure in making s’mores, carving pumpkins, or catching up with friends. Overall, approximately 225 students attended Haunted Halls, and the event was widely considered a success. Both WCC and MCC look forward to hosting another large-scale event next semester along with future Haunted Halls. Andrew Fisher is the Programming Chair of the Warren College Council. 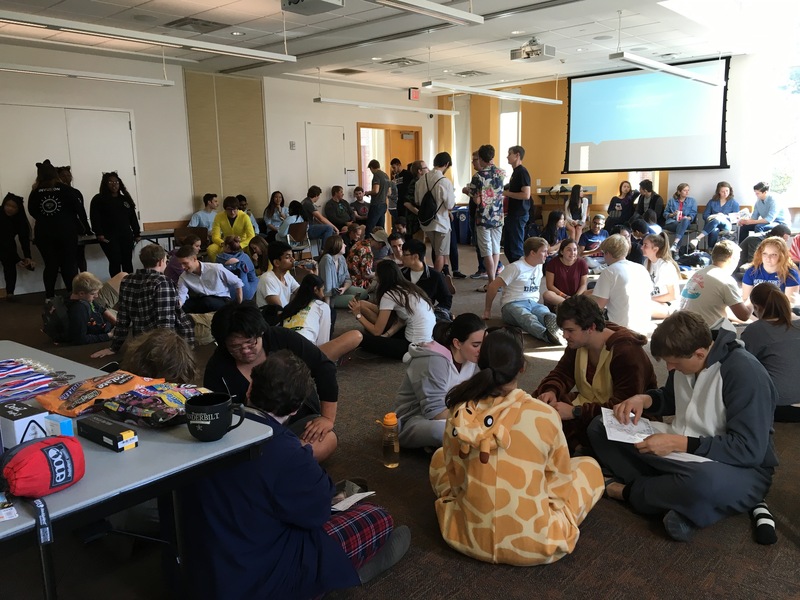 On Saturday, November 5, I watched about 150 students venture out across campus on Commodore Quest, which was created, planned, and executed by four Warren students. The Warren budget and staff, particularly L Hildner, helped with funding and organization, but this was an exemplar of student-driven programming all along the pipeline. The event was open to students across campus, who were attracted by a variety of media and the station the organizers set up at the Rand Wall. 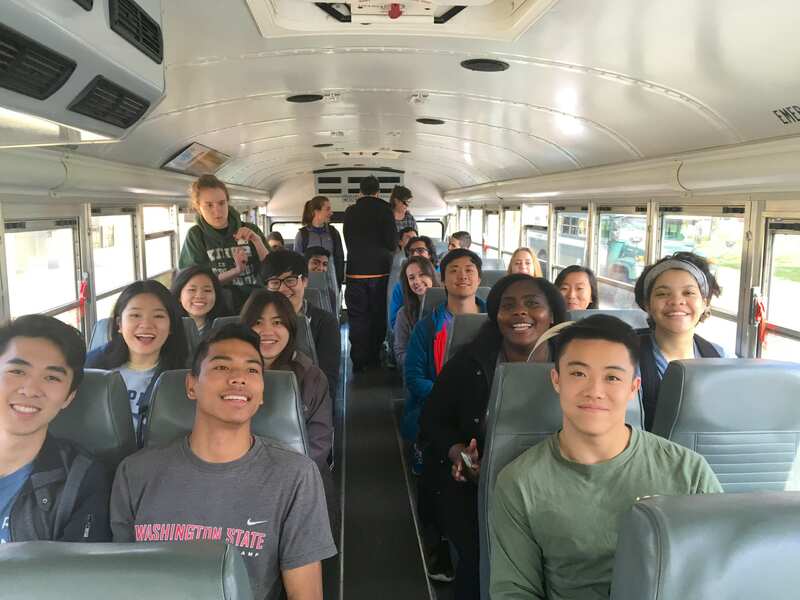 The Quest started at the Kissam MPR at 1:00 pm, and ended several hours later at the same place, when prizes were given and dinner from Maggiano’s for all. The Dean of Students and Campus Dining were all looped in. 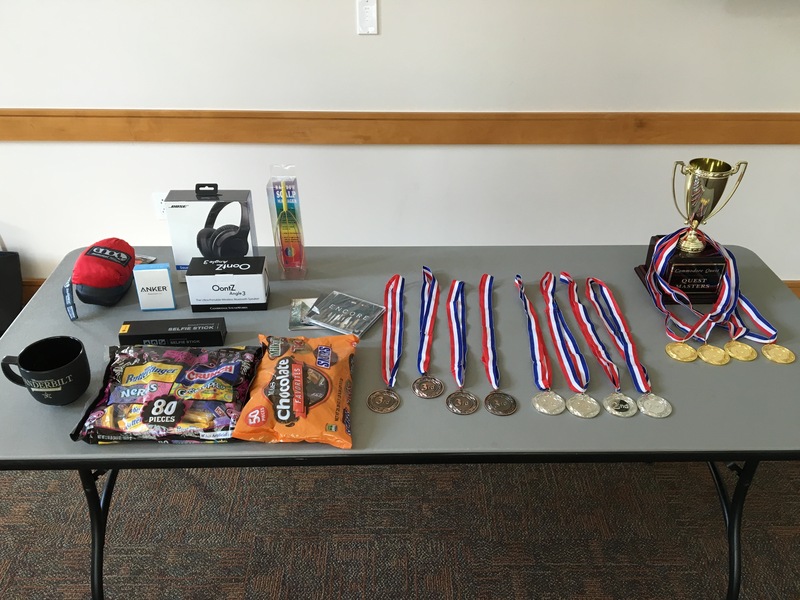 In addition to raffled prizes to individuals, the first team returning to Kissam MPR with the correct global solution received the grand prize. The team name and the names of its members will be engraved on a trophy that will contain the names of future winners as well. We are looking for a place for the Commodore Quest Trophy in Warren now. These videos show the start of the Quest. A Commodore Quest assistant at one of the unfathomable clues! 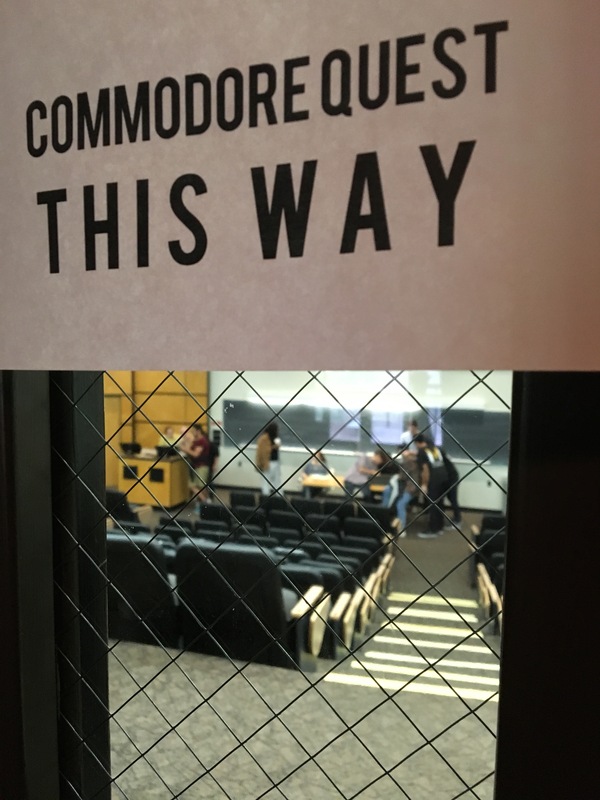 The organizers want Commodore Quest to become a student organization. Is this something that bothers me? No, far from it. 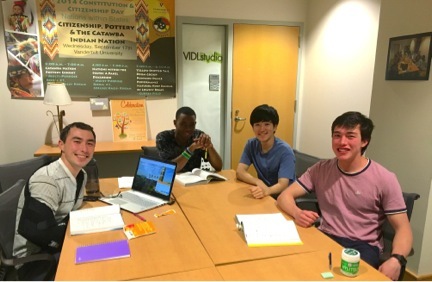 These students have provided a marvelous example of how a residential college like Warren can be an incubator for student initiatives that then become part of the larger campus culture. I support them in taking the next step. If they want to take the trophy with them, then we’ll turn it over happily, but they have indicated that they’d like it to stay at Warren, as an acknowledgement of the Quest’s origins. Thanks Jonathan Amaro-Barron, Maddie Aroner, Chandler Barnes, and Katherine McGee for creating and organizing Commodore Quest! For those of you who lived in Warren and Moore last year, you likely know that it was a year of progress and refinement. For me, it was also a year of growth and learning, since it was my first year living and working in this community. As the only new Graduate Fellow last year, I was most definitely the new kid on the block. I had not been here to see the opening of Warren and Moore the previous year, and it took time to catch on to the way things operated and to truly start to understand the mission and purpose of this place. Fortunately, I had the support and guidance of a wonderful team of Faculty Directors, Graduate Fellows, and Area Coordinator who had been here from the beginning, in addition to our fabulous residents and Resident Assistants. Over the course of the year, I soaked up as much information and wisdom from them as I possibly could, and before I knew it the other three Graduate Fellows were graduating and our Area Coordinator was promoted to Assistant Director of Residential Education. As I think back to last spring and the point in time when I realized how much change seemed to be approaching at Warren and Moore, I remember feeling both a sense of anxiety and excitement. Each year Warren and Moore seems to develop a little bit more and everything seems to go just a little bit smoother. Yet, with so many of the original staff members departing, I remember wondering whether we would lose some of our momentum and continuity – thankfully, I could not have been more wrong. The first 6 weeks of this fall semester has proven that Warren and Moore is continuing to move forward full speed ahead, and may be doing so even more efficiently than ever before. We have been extremely fortunate to have some new staff members join our team. The three new Graduate Fellows – L, Laurel, and Valencia – have been absolutely phenomenal. They were so incredibly eager to learn and to get to work – in fact, they jumped right in and ran their first Warren and Moore event entirely on their own! They bring a range of unique experiences and valuable perspectives, and have already had a big impact. Jordan, our new Administrative Assistant, has also been a real lifesaver. He has become the link that connects the team and keeps us all moving in the same direction. Similarly, Courtney, our new Area Coordinator, and Chris, our new Graduate Area Coordinator, have not missed a beat and have wasted no time getting right to work. Our RA staff put together a great Courtyard Carnival and has been absolutely critical for introducing residents to Warren and Moore and fostering a strong sense of community. And props to all of our residents for attending and engaging in so many of our programs – if you had asked me a few weeks ago, I would have never guessed that 55 people at a Moore College Sunday Dinner would ever happen! Overall, the dynamic here at Warren and Moore thus far has been wonderful. Everywhere I go I see great programs and great residents engaging in those programs. Furthermore, everyone I speak with who has lived in Warren and Moore before seems to agree that this year feels a little different. So thank you to the entire Warren and Moore team and community for helping to shape with place – I’m looking forward to the rest of the year! This blog post was written by Brooke Thayer, the Graduate Fellow of Smith Hall. 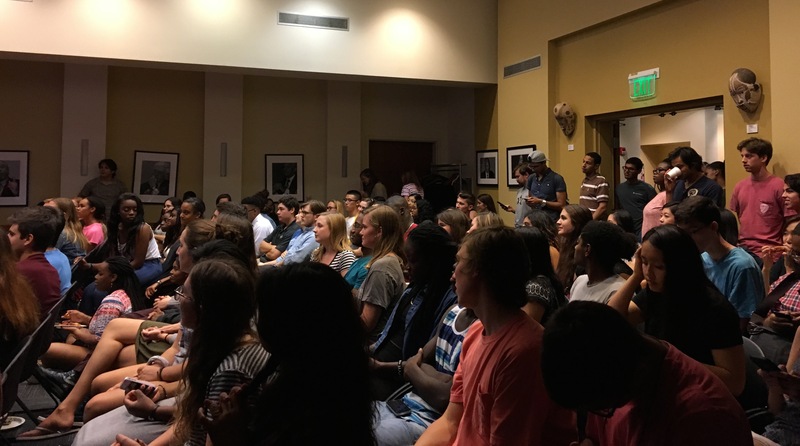 The opinions expressed herein are Brooke’s, and do not necessarily represent those of Vanderbilt University. 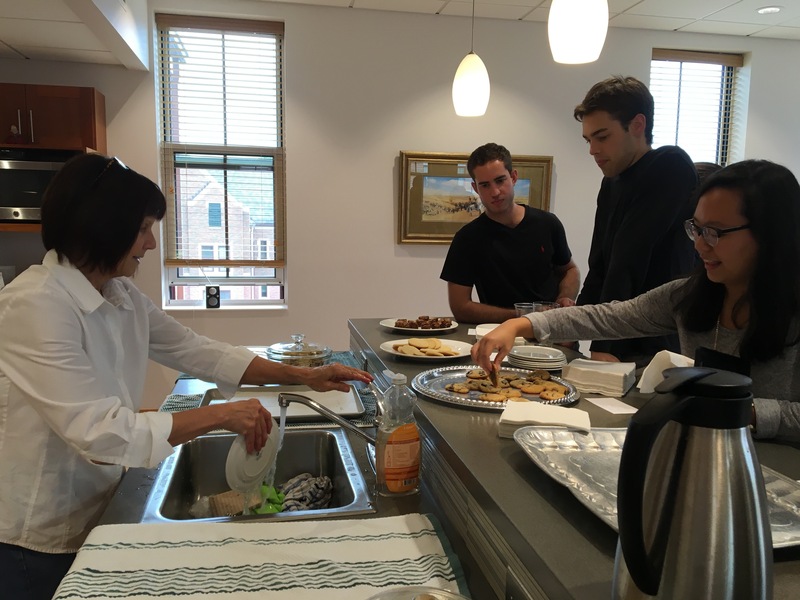 Patricia’s Fresh Baked Fridays is a popular gathering for students, both inside and outside of WaM, and for staff too. Its a place to relax, talk to old friends, and to meet new people. Just two weeks ago, a vaguely familiar woman bounded towards me with a big smile, and introduced herself as one of my students more than 20 years ago. Her son, now a Warrenite, had brought her to FBF to see her old professor. What a treat! How cool is that! It is so moving too, at least for me. At FBF, I also learn about things going on around campus, usually sponsored by student orgs. 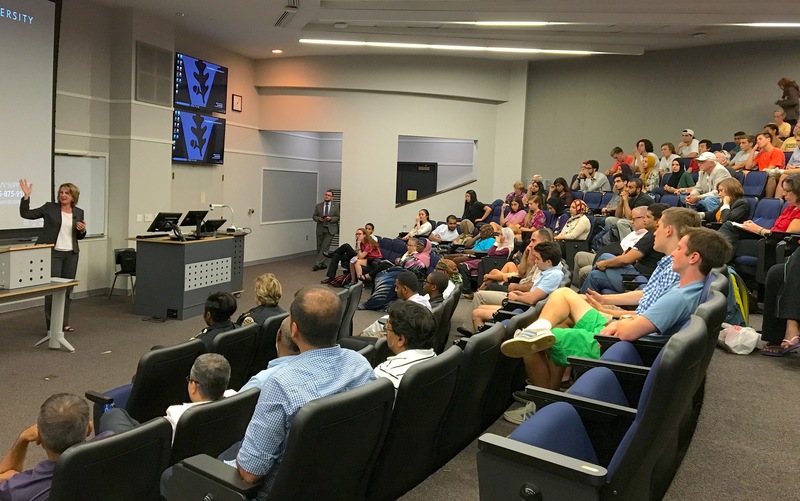 I’ve written before about my visits to events around campus, and learning how involved WaM students often are (student-driven programming and Warren Envoys). At the Sept 9 FBF, I was talking to some students, and they excused themselves to help set up for an evening event at Wilson. 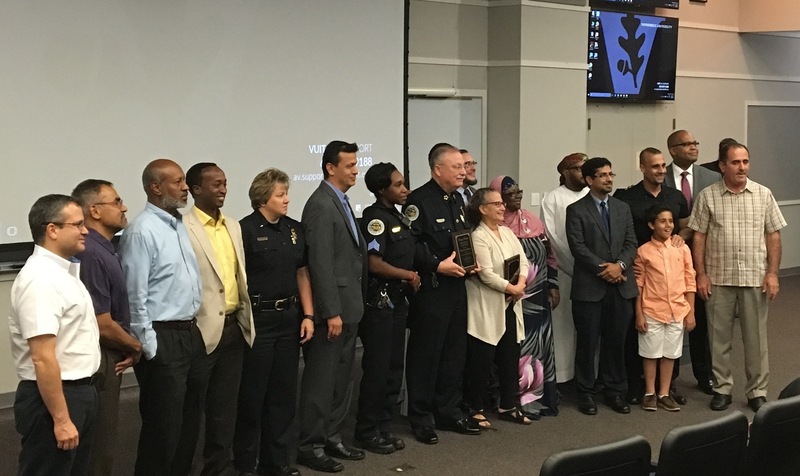 It was a great event in which the local Muslim community thanked Nashville police, and they jointly celebrated community building and spoke on their work against terrorism. 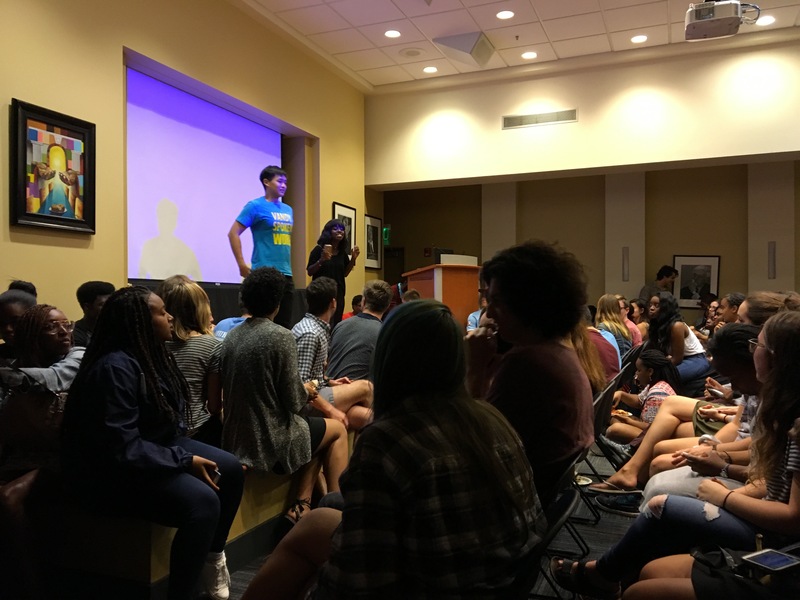 The week before, on Sept 2, I learned about the Wild Summer Open Mic night at the BCC, cosponsored by Vandy Spoken Word, Lambda, Hidden Dores, Delta Tau Delta and the Vanderbilt Review, to help us all to process the many violent events of the summer. 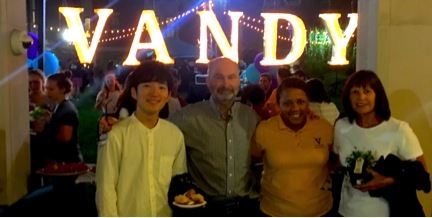 Warren College is defined and guided, in part, by the place of Warren students in the larger Vanderbilt community. Patricia and I are so lucky to live here. It is the only job in which I have to check my calendar to see whether I have something scheduled earlier than 8:00 am, or after 5:00 pm, so its work for sure, but the kind of work I wish others could experience, and would aspire to experience. Elsewhere on the blog you will find other reflections during our brief history at WaM. You are welcome to contribute to those reflections on our past and thoughts about our future!